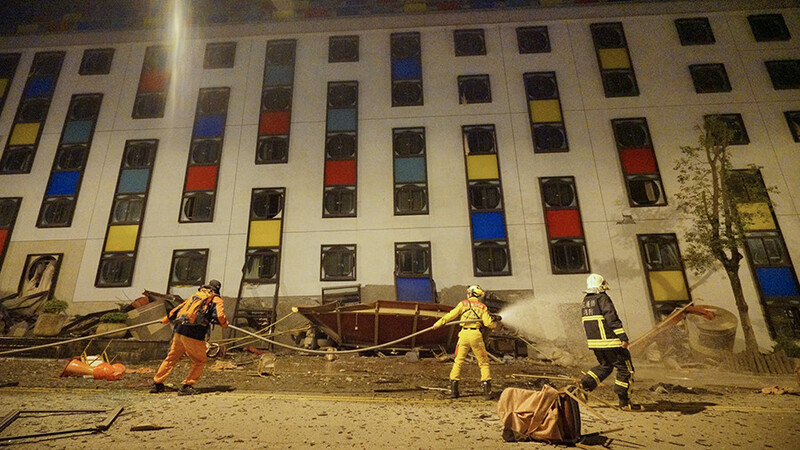 A 6.4-magnitude earthquake struck the east coast of Taiwan, causing a hotel and several other buildings to collapse. At least four people were killed and more than 220 others injured, while about 145 remain missing. The epicenter of the quake was reportedly 10km deep, some 22km east-northeast of Hualien City, the US Geological Service (USGS) reported. The initial 6.4 quake, which struck at 11:50pm local time, was followed by a number of aftershocks, with at least four measuring five points and higher on the Richter scale, the USGS data shows. As of 9:00am Wednesday, the Central Disaster Response Center counted four deaths and 225 injuries in Hualien. Multiple injuries have been reported and rescue workers have been deployed to the scene. According to the Central Disaster Response Center, at least three people remain trapped underneath the debris in Marshal Hotel. According to local media, in addition to Marshal Hotel, the quake damaged the 2nd Cloud Gate Tsui Community Building, where up to 20 people remain trapped. Two community buildings on Kwong Shing Street also suffered damages. Authorities believe that more people are still trapped inside those buildings. “The president (Tsai Ing-wen) has asked the cabinet and related ministries to immediately launch the ‘disaster mechanism’ and to work at the fastest rate on disaster relief work,” the president’s office said in a statement.